This study is the first India-focused analysis of long-term electricity generation and associated emissions. Ensuring access to electricity is one of the foremost challenges faced by policy makers in developing economies. As the economy grows, increase in electricity demand and rise in end-use services are bound to happen. Water demand in power plants is a critical issue requiring the immediate attention of global policy makers and other stakeholders. 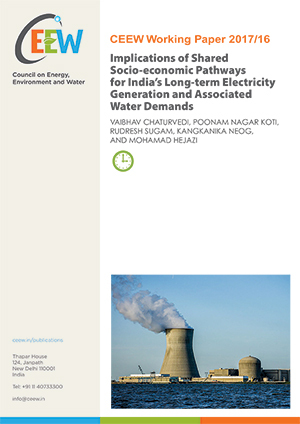 The study examines various possible evolutions of India’s electricity generation sector across five different Shared Socio-Economic Pathways (SSPs). SSPs are narratives that have been developed recently to better understand mitigation and adaptation challenges SSPs describe different visions of the future world based on analysis of underlying social, economic, and technological drivers. India is a water-scarce country. The utilisable water resource was estimated to be only 1123 billion cubic metres (bcm), 28 per cent of the total water resources available. Six hundred and eighty bcm of this was estimated as consumption across sectors in 2000, with the irrigation sector accounting for 88 per cent. Eighty-four per cent of coal-based capacity and 100 per cent of gas-based capacity is based on cooling tower technology. 75 per cent of inland nuclear-based capacity uses cooling towers. Seventy-five per cent of seawater-based coal power plant capacity and 100 per cent of gas power-based capacity uses cooling tower systems. The electricity generation mix ranges from a 65 per cent share of solar and wind in 2095 in the sustainable world under SSP1 to an 88 per cent share of coal in 2095 under the fossil-intensive SSP5 scenario. Water consumption by India's inland thermal power plants will increase by 4.0- 5.6 per cent per annum in the absence of dry cooling technology between 2015 and 2050, and by 6.5 per cent per annum under SSP5. The challenge to adaptation will be especially high in the SSP3 and SSP4 worlds (which take regional rivalries and social inequalities into account, respectively), with mutual cooperation and equal access to resources coming under threat. The role of dry cooling will be critical to India’s adaptation to rising water demands in thermal power plants. 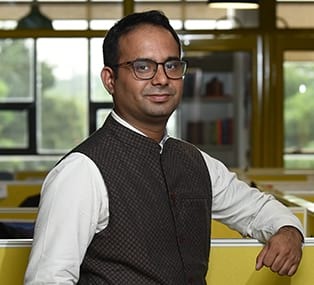 The rate at which India’s electricity and related water demands could evolve will be defined mainly by how India’s population, income, lifestyle, policies, institutions, and technology evolve in the future.